Snacks are healthy options when they are high in nutrition and energize our bodies and mind. Many of us look for full flavour and texture in snacks, so we’ve got some tasty ideas that will satisfy your belly and tastebuds. 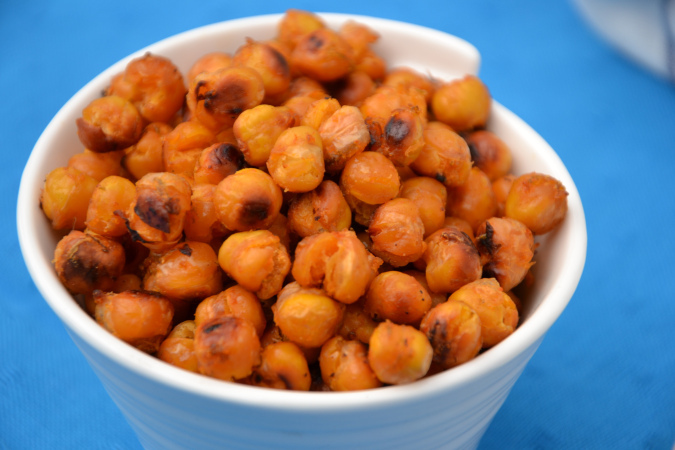 Roasted chickpeas make a nutritious option because they are high in fibre and offer some protein and iron too. And of course, they are super tasty! Roasted chickpeas have a chewy and crunchy texture that’s fun to eat. These delectable snacks are perfect for packing in lunches, nibbling at a party, as an appetizer or enjoyed while cheering on your favourite sports team. They are simple to make and can easily be prepared a couple of days ahead. 2Line a baking sheet with parchment paper or grease with a little oil. In a large bowl, combine chickpeas with flavourful ingredients and toss to coat well. 3Spread chickpeas on prepared baking sheet and bake for 35-45 minutes, stirring half way through. 4Allow to cool slightly before eating. 5Store in an air-tight container and enjoy within 2 weeks.